Insists only restructuring will save Anambra guber poll.. Pro - secessionist crusader and leader of the Indigenous People of Biafra (IPOB), Nnamdi Kanu, has sensationally declared Ebonyi state, a free Biafran state and vowed to shut down governance in the ‘salt state’ for three days on his next visit. Kanu, made the controversial declaration while addressing thousands of Biafra agitators during his tour of Ebonyi state on Monday. “I have come to declare Ebonyi a Biafra state and when next I come, I will shut down the state for three days”, he declared amidst cheers from his supporters. During his stop in Enugu, the Abia state born Biafra agitator had declared that the Anambra state governorship election slated for November 18, would not hold unless the federal government restructures Nigeria by October 1, 2017. Kanu issued the veiled threat while fielding questions with newsmen at a brief event where he received awards from three Igbo groups- the Eastern Consultative Assembly (ECA), the Igbo Students’ Association (ISA) and the Igbo Women Assembly (IWA), in Enugu. Kanu said “There will be no election in Anambra state come November 2017 and going forward there won’t be any election until they give me date for a referendum. They know what to do; convene a meeting, I will send my rep, give us a date for referendum, that is the only way. “In which part of this earth have you ever found a measure of self-determination to be equated to war except in Nigeria because the political leaders do not understand the difference between self-determination and war? On oppositions to his call by the Ohanaeze Ndigbo and other Igbo leaders, Kanu said their stand makes no stand because “the people are with us; we have their support 100 percent and come 18th of November 2017, the world will be amazed. However, while describing Nigeria as a ‘failed state’ and a ‘zoo’, Kanu urged Ebonyians, to boycott the 2019 general election and all subsequent elections in the state by the federal government until the demand for referendum is granted. “Nigeria is a zoo and a dead country that will be buried tomorrow. No one from Ebonyi should vote for Nigeria in 2019”, he said. 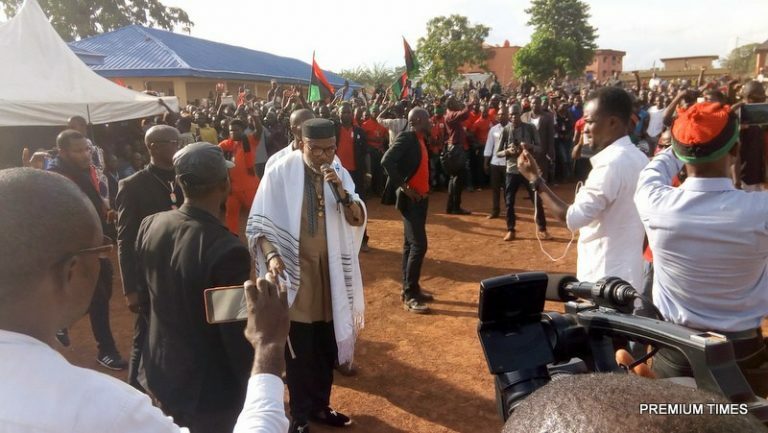 The tough-talking IPOB leader, who stopped briefly at at Yaweh Church for a brief prayer before proceeding to Abakaliki in a motorcade amidst tight security, assured his supporters that Biafra has come to stay. “I will teach our enemies what they do not know. I will teach them that nobody can stop Biafra because Biafra has come to stay”, he boasted. Kanu equally vowed to continue his tour of what he called Biafraland, insisting that nothing will stop him from his secessionist crusade. His words: “I will traverse all parts of Biafra land and other areas without anybody stopping me including police and soldiers who are always in the habit of harassing people. I will continue to walk in the midst of these security agents as you can see and nobody will arrest me. They know they cannot stop Biafra. Earlier in a presentation termed “Enugu Declaration”, different Igbo groups at the event called on the government not to make further delay towards restructuring the country. The declaration was signed by Dr Alfred Udokwu; South East Elders Union; Rev Fr John Odey, Eastern Consultative Assembly; Bishop Mike Ibenene, South East Christian Network; Chief (Mrs) Maria Okwor:Igbo Women Assembly; Evangelist Elliot Ugochukwu-Uko, Igbo Youth Movement, among others. They noted that the struggle by the ruling clique to sustain the present centralist federal system imposed on Nigeria by the military was no longer acceptable to Ndigbo. Their joint statements read in parts: “Their arrogance, and ruthlessness has no place in the 21st century. It can only lead to the death of Nigeria. Nigeria must be restructured if Nigeria is to survive, and egalitarianism, equity and merit-based system enthroned. The statements read further: “We restate that if genuine processes towards restructuring Nigeria are not embarked upon by the federal government on or before the 1st of October 2017, our people will find it extremely difficult to continue to participate in the Nigerian project. According to the Igbo groups, continuing to vote in elections in what they called ‘dysfunctional land’ will be “deepening the hole the country has fallen into”. “We will no longer vote in any elections whatsoever until Nigeria is restructured. This is the demand, desire and decision of the masses of Eastern Nigeria. We, therefore, conclude, that apart from the political class and their structure and the elite club who live in comfort zones, 99% of our people do not see any benefits of electing leaders the structure makes it impossible to hold accountable.